Origin: Northern Mexico to southern Brazil and Paraguay. Habitat: Tropical forest areas near rivers and streams. The red iguana has reached legendary status as the most popular reptile pet. A 55-gallon terrarium is the best choice when selecting a first cage for your red iguana. Once the red iguana outgrows the terrarium, it will be necessary to replace it--usually with a custom enclosure. The cage should have a selection of strong branches and plenty of vertical space for climbing. Approximately 40 percent of a red iguana's diet should consist of dark, leafy red vegetables. Other vegetables should make up another 40 percent, with juicy, fresh fruit making up the last 20 percent of its diet. A high temperature gradient is important for iguana digestion. An overhead light source is the most natural way for iguanas to receive heat. The cage's temperature should range from 75 degrees Fahrenheit at the cool end to 95 or 100 degrees Fahrenheit at the warm end. At night, the temperature can drop to about 70 degrees Fahrenheit. 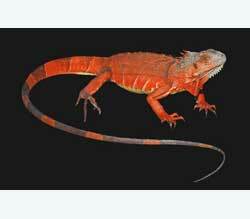 Indoor red iguanas should have a full-spectrum bulb included in their cage setup. If possible, iguanas should be housed (either temporarily or permanently) in outdoor enclosures, as natural sunlight is extremely beneficial to red iguanas.